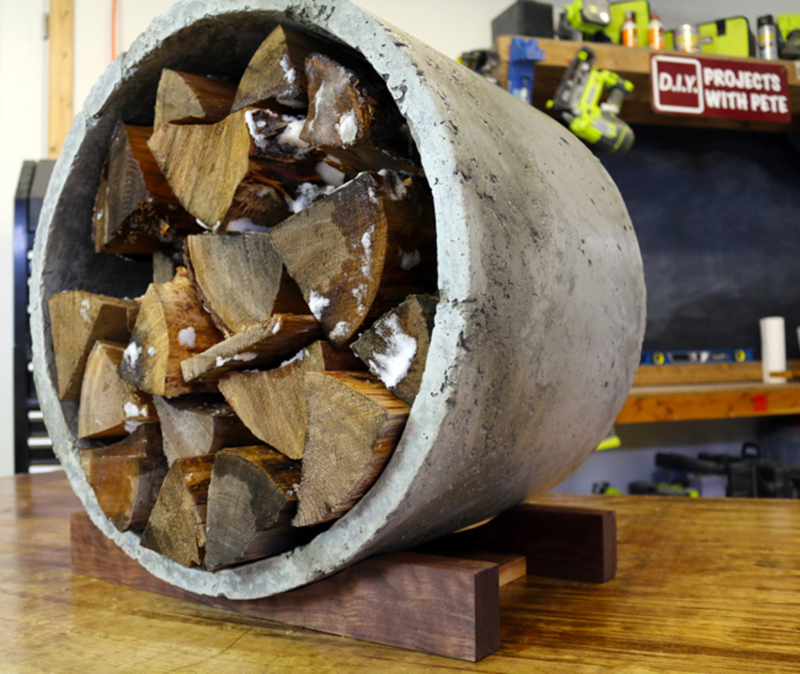 Learn how to make a very modern looking, circular, concrete log holder from DIY Pete. 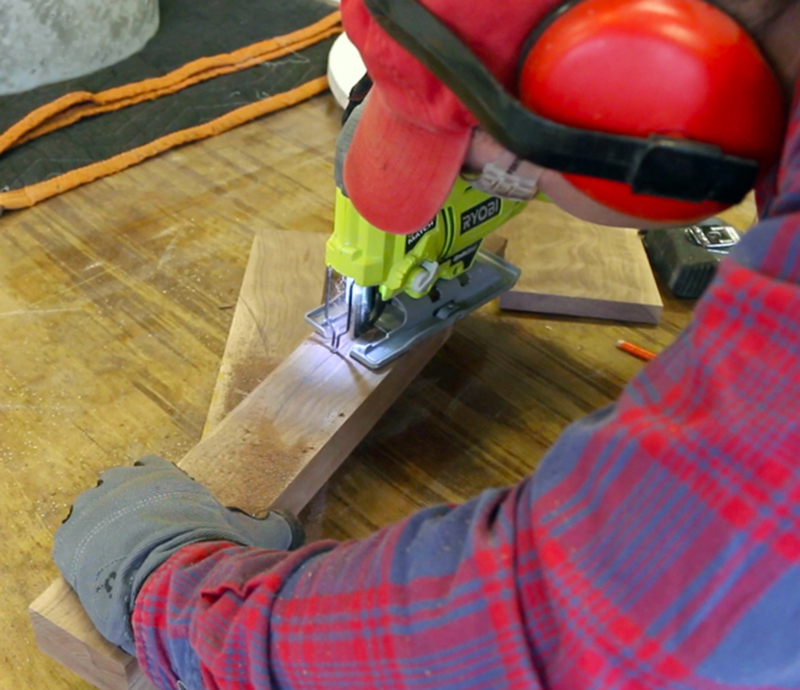 This project is simple to do, is very affordable, and doesn’t take long at all from start to finish. The concrete log holder adds a nice touch to any fireplace and is very functional. Thanks for checking this out and best of luck on yours! We need to start by making the form with the aluminum flashing and the melamine. 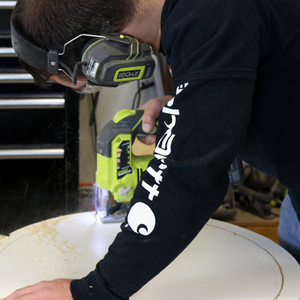 The circular melamine pieces will be cut out with your Ryobi Jigsaw. 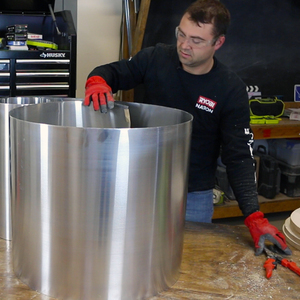 Measure and mark a 22” diameter circle. Cut the melamine with your jigsaw accordingly. Save the circular offcut from the larger circle, we’ll use this later. 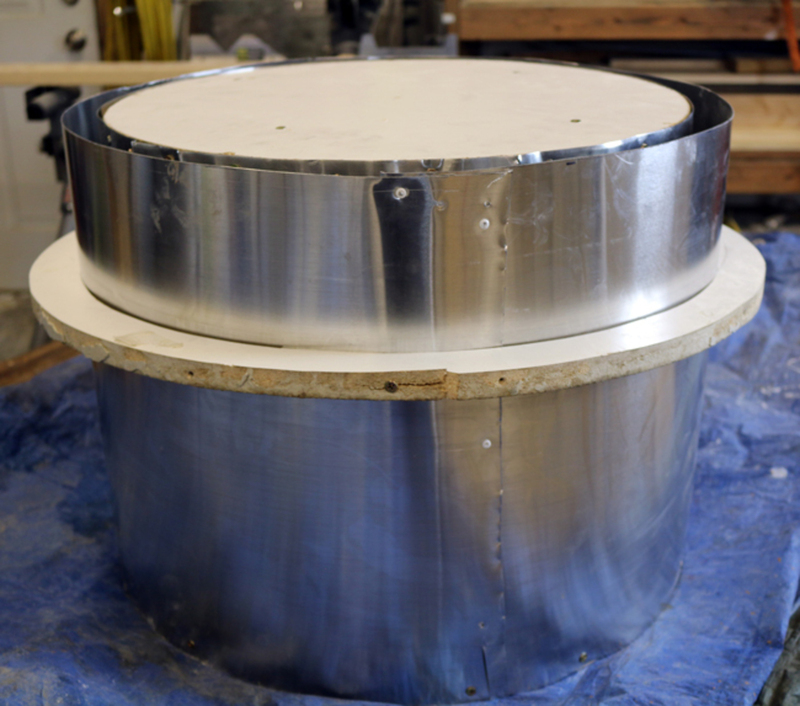 Measure and mark a 19 ½” diameter circle. Cut four of these pieces from the melamine. Cut the aluminum flashing to size. We’ll need one piece at 16” tall and the other at 16 ¾” tall. 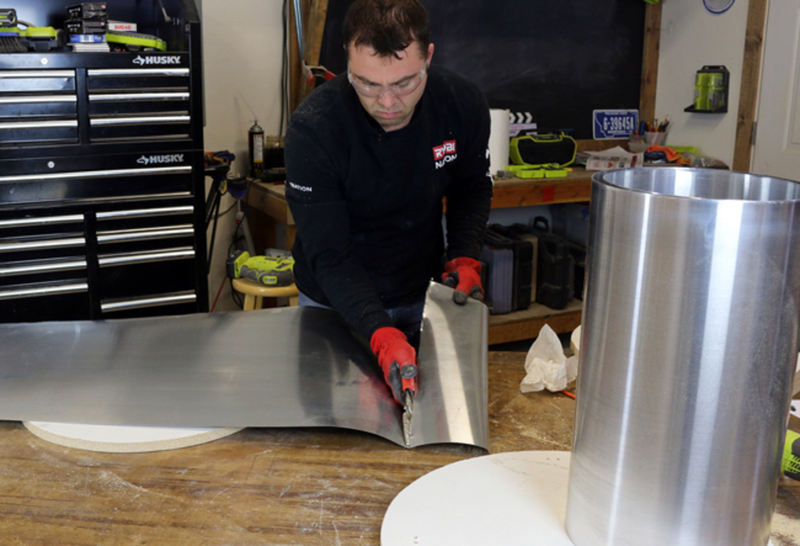 Wrap them around the melamine circles to figure the length and cut them with aviator snips. 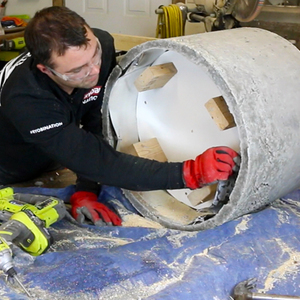 You can use a cutoff wheel on an angle grinder to get a cleaner cut and then grind all of the sharp edges smooth. 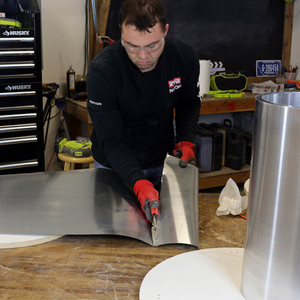 Build the outer portion of the aluminum flashing and melamine form. 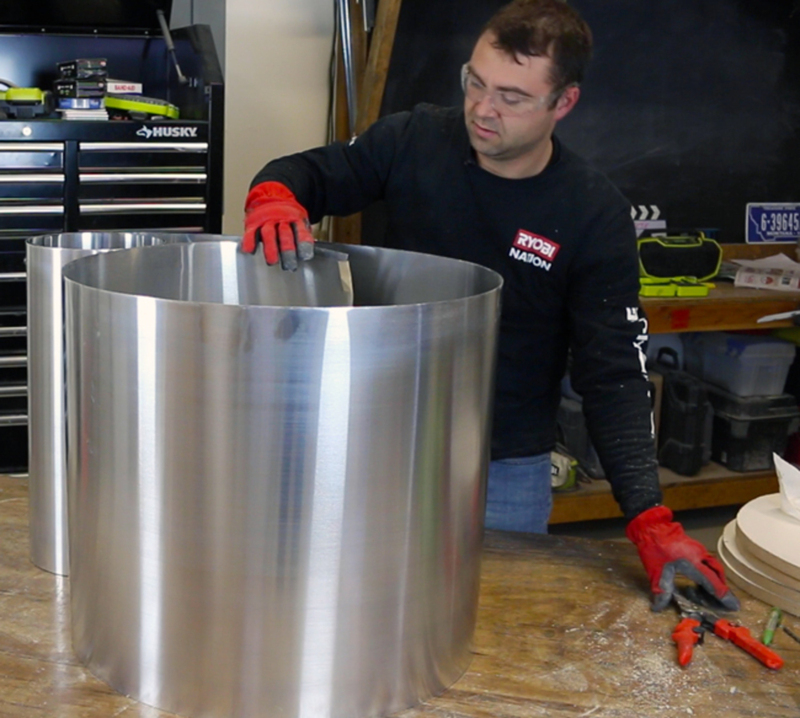 It consists of one 22” diameter melamine bottom, and aluminum flashing cut to 16 ¾” long and then secured into the bottom melamine piece. Refer to the photos for a visual representation of this. Let’s build the inner portion next. The inner portion of the form is a bit more difficult to put together. 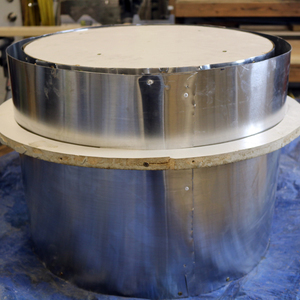 We need this to be strong, as the weight of the curing concrete will be pushing in on the inner portion of the form. 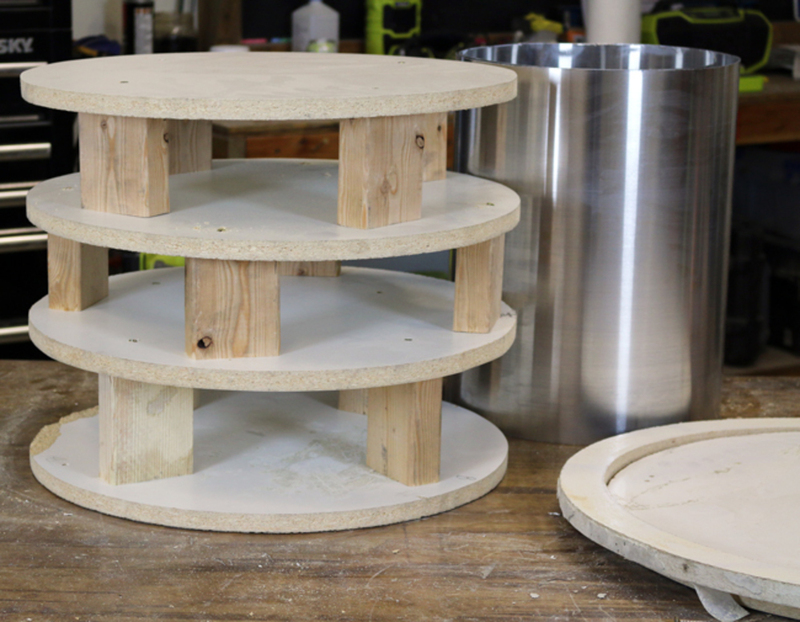 We cut four circular pieces of melamine for this, stack them together with 2x4 pieces, and attach the top and bottom pieces to the aluminum flashing. 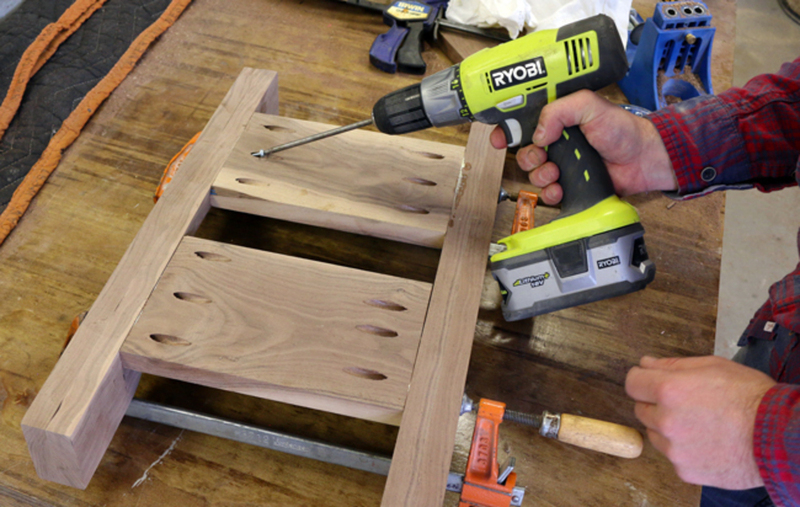 Space the four melamine pieces apart with 2x4s cut to 4 ¼” and screw them into the melamine pieces with 1 ½” wood screws. Center the inner portion of the form inside the larger, outer portion and screw them together from the underside of the outer portion. You can seal the edges of the aluminum flashing with tape, if desired. 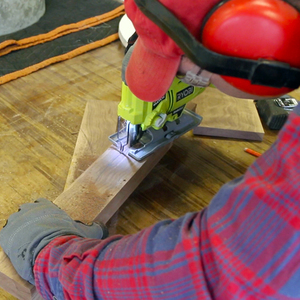 This is where you can add the outer portion melamine offcut on the outside of the form for added support. Mix your Quikrete 5000 and water to get a good, peanut butter-like consistency of concrete. Pour it into the mold and start filling it up all of the way. 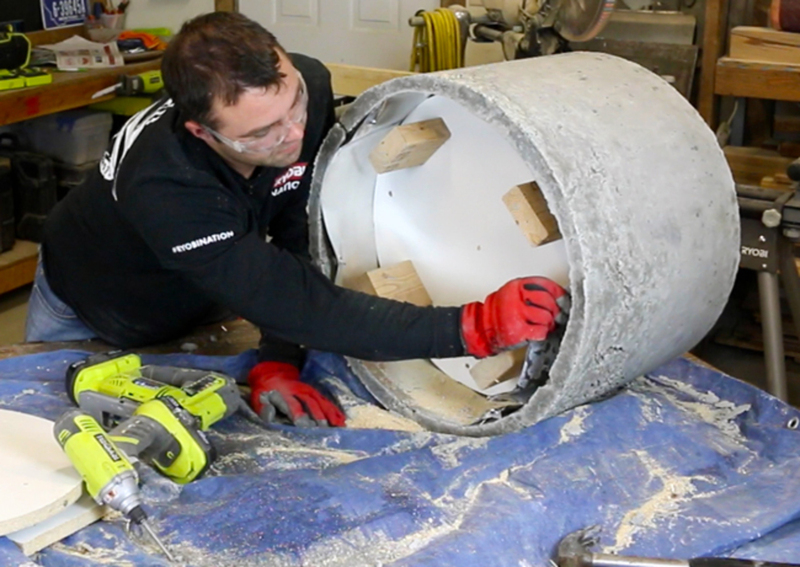 You’ll use all of two bags of the concrete and will need part of a third, as well. Make sure to clean your concrete mixing, leveling, and all tools after this. 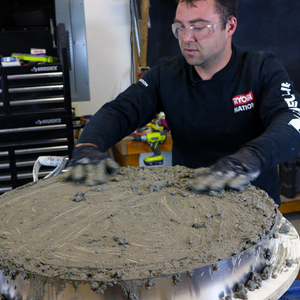 Let the concrete cure for the manufacturers recommended time before de-molding it. 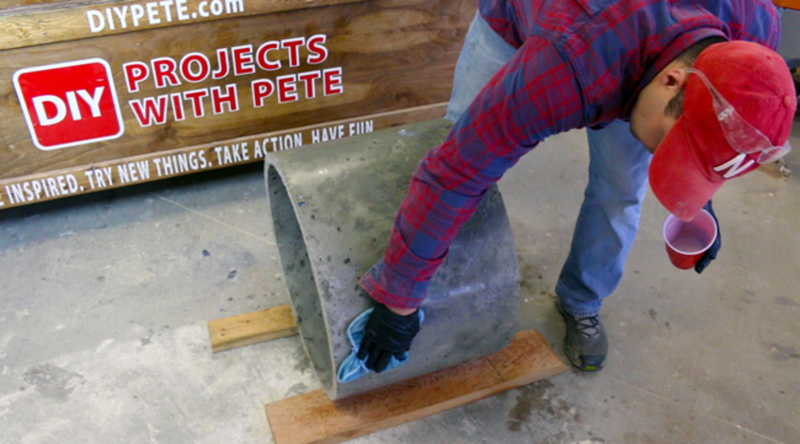 De-mold your melamine and aluminum flashing form once the concrete has cured! Take your time here, being careful not to damage the concrete at all. The inner portion of the form is a bit trickier to deconstruct and take out. 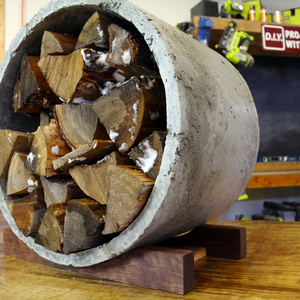 You might have to drill into it, cut with snips or a saw, and work it out slowly. 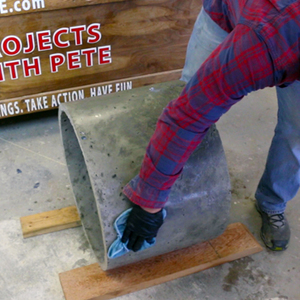 Let the concrete continue to cure and then build your wood base. I used walnut hardwood cut to 3” wide by 2” thick. Trace the outline of the outside of the concrete circle onto the wood and then use your Jigsaw to cut out the shape. Construct the base using two boards in between the stands as support structures. 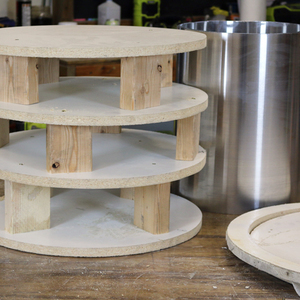 Kreg Jig them and glue and screw them into the curved stands. 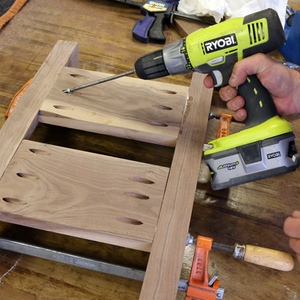 Sand, finish, and coat your wood base with a danish oil, let soak in, then wipe away excess. 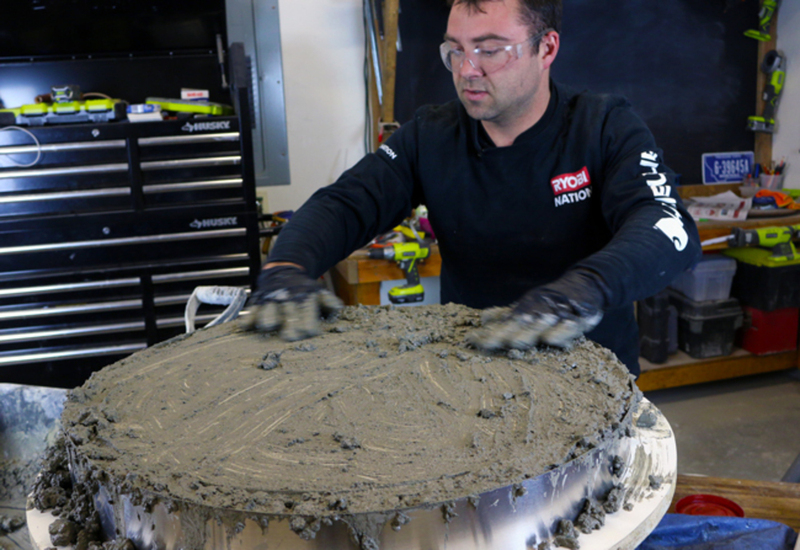 Sand, finish, and fill in any voids on the concrete circle. Use a water based sealer and add three to four coats to the concrete, letting it cure before use. 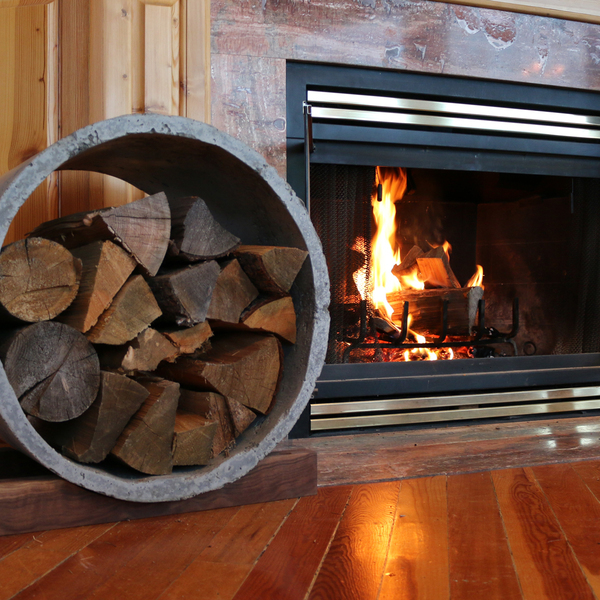 Install it in place, add firewood to your log holder, and enjoy!